The most comfortable sandals you'll ever wear! 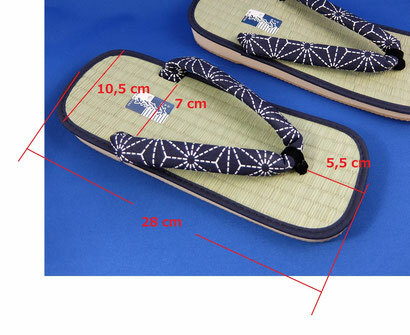 A pair of Japanese traditional sandals with fabric toe-thongs. 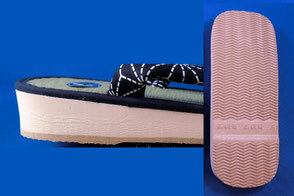 This stylish footwear have a tatami style base and a cushioning sole. They are quite light weight and really comfortable, perfect to wear especially with a Summer! These sandals are called "Zori" or ''Setta'' have been worn in Japan until western-style shoes spread after the Meiji era. Of course, samurai, too. Since they are very comfortable & healthy, many people nowadays wear them with casual wear too. 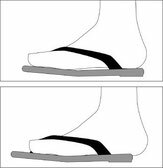 Ein Paar traditionelle japanische Herren Sandale, genannt "Setta" oder "Zori". Die stilvolle Sandale besteht aus stabilem Tatami-Fußbett und einer Hartschaumstoffsohle, sie ist sehr leicht , wirklich bequem und ideal, vor allem im Sommer zu tragen! Sie ist traditionell mit einem Yukata oder Sommer Kimono getragen, auch fuer tägliche Bekleidung sehr passend. Darüber hinaus ist sie ideal für japanisches Kostüm von Manga / Anime / Cosplay. The upper part is Tatami, made of a natural rush, has edging fabric. Anti-slippy EVA-Ethylene vinyl acetate is used for the bottom that provide a much better comfort and grip for the feet. The toe-thongs are used a padded cotton. Der oberer Teil ist Tatami, aus natürlichem Igusa-Gras (einer Art Binsengras) und die Dämpfungssohle ist aus Antirutsch EVA, die viel Komfort und Halt für die Füße bereitstellt. Die Y-Steg ist aus gepolsterter Baumwolle, erhältlich in 3 verschiedenen Muster. 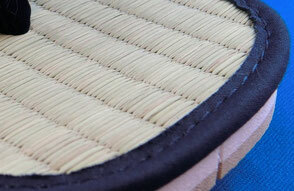 material... Tatami made of natural rush, fabric (toe-thong and edging), EVA-Ethylene vinyl acetate (cushioning sole). Right and left shoes are not identical. A pair of authentic Japanese sandals called "Setta". 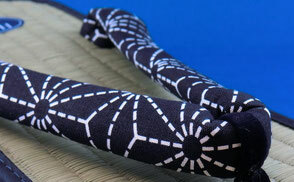 Surfacec is Tatami, made of natural rush with a fabric thong. "Asanoha" (hemp leaf)" is one of the most popular Japanese traditional patterns. This pattern was named Asanoha because the shape literally looks likea hemp leaf. In spite of its name, however, the pattern did not borrow motif from a plant. It is a geometric design with six diamond-shaped patternsarranged in a radial manner. Identifying the hemp which grows well with the growth of a baby, the pattern has been often used for swaddling clothes. A pair of authentic Japanese sandals called "Setta". Surface is Tatami, made of natural rush with a fabric thong. Please note that you might feel the toe-thongs (straps) very tight at the beginning, but it’s normal, they will stretch as you wear them. Traditionally, the Setta is slightly shorter than the foot and it lets the heel to protrude a few centimeters. The western style consists in retaining a full heel supports. We recommend you to opt for the Japanese style, since it creates good posture and balance. Tatami is a word for the traditional Japanese floor mat made of rush. Natural rush touches your feet comfortably and gives a refreshing feeling. 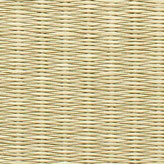 Durable rush is woven by hand so the Setta will become firm and resilient naturally.